Sydney Cycle Chic: Sydney Cycle Chic Does Art Month Sydney! Sydney Cycle Chic Does Art Month Sydney! Now in it's second year, Art Month Sydney is a brilliant festival celebrating the city's thriving contemporary visual arts scene. Each week during March the focus will be on a different one of Sydney's diverse arts precincts. From Waterloo to Woollahra, Marrickville to Potts Point, some 80 or more galleries and venues will fling open their doors with exhibitions, artist talks and studio tours. In a first this year, the festival is also introducing weekly curated bicycle tours of each precinct. Brilliant idea. 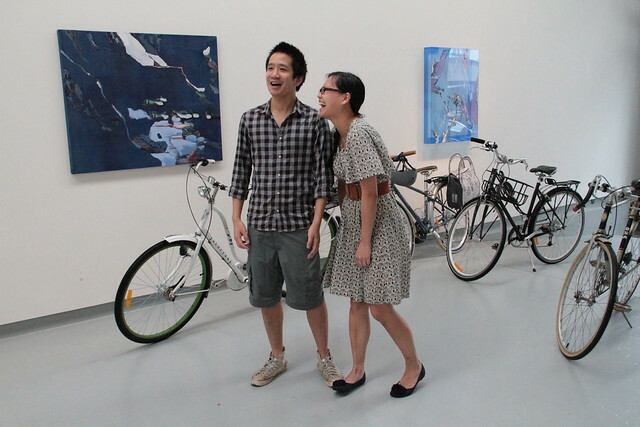 Can't think of a better way to explore the city's galleries than by bike. So we are very excited to be taking part as we join with Art Cycle for the Surry Hills ride on March 19. Rides are free but you do need to register - details here - and make sure you check out the rest of the festival too - a whole month of art events? We call it artalicious! We've had some fun doing some pre-festival filming - yep, we always ride our bikes in art galleries, we're crazy like that!